The Charmed Lives in Greece exhibition that opened at the British Museum showcases the friendship of the artists Niko Ghika and John Craxton, and the writer Patrick Leigh Fermor and their shared love of Greece. Running until 15 July 2018 the exhibition focuses on four key places – Hydra, Kardamyli, Crete and Corfu – where they lived and spent time together with the works of art reflecting the sights, sounds, colours and people they met in these beautiful places. Planet Holidays, the ABTA and ATOL specialist tour operator to Greece and Cyprus offers a wide range of holiday options to see the places that inspired the three friends, including tailor-made options that can include the smaller island of Hydra and the Peloponnese resort of Kardamyli. Craxton restored a house in Chania on the northwest coast of Crete, famous for its picturesque Venetian Harbour. Planet Holidays offer the 5-star all-inclusive Panorama Hotel just 5km from Chania – the ideal base for exploring the town and nearby area. Prices are from £822 per person for one-week in Chania staying at the 5-star Panorama Hotel on an all-inclusive basis travelling on 10 May, including return flights from Gatwick to Chania. Ghika lived in Hydra, before moving to Corfu to transform an old building into an idyllic home and garden with his second wife. 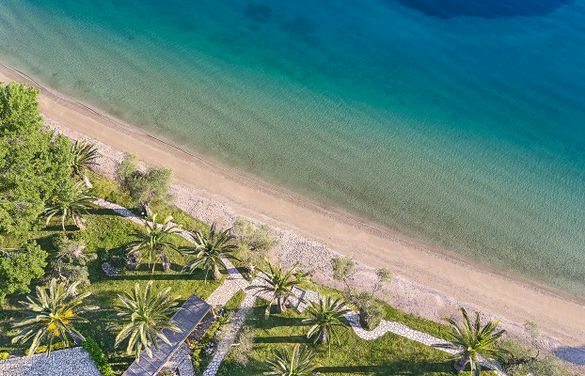 Witness Corfu’s breath-taking beauty staying at the 4-star all-inclusive Grecotel LUX ME Daphnila Bay Dassia set on a hillside with stunning views. Prices are from £1,487 per person for one-week travelling 13 June, including return flights from Gatwick.The Luxury Made Easy (LUX ME) concept that Grecotel have introduced at this property provides visitors with 6 restaurants of which one will be operating 24/7, a pâtisserie and chocolaterie, a creperie and gelateria, premium brands, snacks and ice bars, pool and beach service, Grecotel’s little luxuries, 24h WhatsApp Concierge, daily stocked mini-bar and in-room amenities, activities and entertainment for all ages, plus a sumptuous spa. The seaside village of Kardamyli on the Peloponnese was where Patrick Leigh Fermor built a home with his wife in the late 1950s. Planet Holidays can tailor-make an itinerary to include flights and accommodation in Kalamata at the 4-star Filoxenia plus car hire to discover this region including Kardamyli, which is an hour’s drive away from Kalamata. Prices are from £872 per person for one-week at the Grecotel 4-star Filoxenia on all-inclusive, including return flights from Gatwick on 05 June. Car hire for the week, from £249. To visit the island of Hydra, Planet Holidays can tailor-make a holiday with return scheduled British Airways flights into Athens, return transfers to Piraeus and return ferry crossing to the island of Hydra with a 7-night stay at the stylish 5-star Leto Hydra on bed and breakfast and prices from £1,672.50 per person, travelling on 10 June 2018. Planet Holidays offer a great selection of Greek island hopping holidays and have introduced new ‘lesser-known’ islands each year to their programme, 2018 is no exception. For further information contact Planet Holidays on 01438 841 270 or book online at www.planet-holidays.co.uk but kindly note that the island-hopping options need to be booked with a member of the reservations team.